It looks like the new-generation 2015 Mercedes-Benz C-Class is getting some exciting new updates both inside and out. 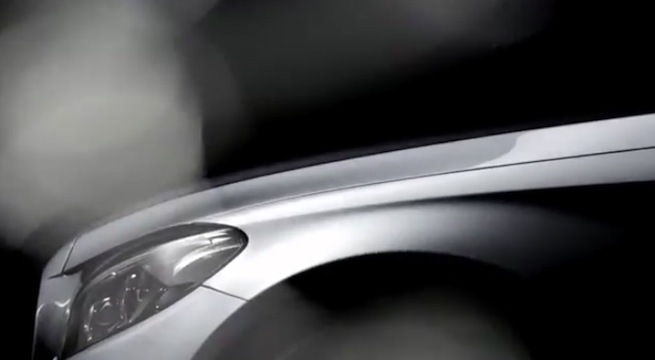 Mercedes-Benz has just released a new teaser video of the new 2015 C-Class model. They reveal some new exterior details and it will also be coming with a newly-redesigned interior. Many 2015 C-Class prototypes have been spied over the last couple of years, but this is our first glimpse of the next-gen C-Class. Mercedes-Benz doesn’t reveal much, but tell us the new 2015 model will be getting a new lightweight body shell for the new C-Class. That will be needed to help achieve the new fuel mileage standards around the globe. The C-Class is truly a global car and sells extremely well in the U.S., Europe and China. It also sells well in South Africa and the BRIC countries. Mercedes reports that the current generation C-Class is also one of the most popular models among business customers. Most business customers in Europe choose the Mercedes-Benz C 220 CDI Estate for its excellent fuel economy figures. So Mercedes is going to improve fuel mileage in the new 2015 C-Class with a new lightweight body so it will continue to popular around the globe. It also looks like the new 2015 model will be getting an all-new interior. Mercedes says, It will be coming with “An interior with high-class ambience and a new touchpad control surface.” The teaser video below shows a few shots of the cabin to give us a first glimpse inside. The new C-Class will likely remain in rear-drive configuration with the optional all-wheel-drive 4MATIC. It will also come loaded with the latest high-tech electronic gadgets and assistance systems Mercedes offers. The coupe will continue to be offered and the popular estate model will be offered in Europe. Global performance fans will continue to have reason to rejoice as the high-performance C63 AMG will continue on, but it may be losing its awesome 6.2-liter V-8. It will likely be replaced with Affalterbach’s new twin-turbocharged 5.5-liter V-8 capable of 550 hp. And it may get anew name change with the new powerplant and go by C55. We should look for the all-new next-generation 2015 Mercedes-Benz C-class to hit global markets early next year. It could make its global debut at the 2014 Detroit Auto Show in January. Stay tuned to Torque News for the latest Mercedes-Benz 2015 C-Class news.